Raumati collectively refers to two neighbouring places on the Kapiti Coast of New Zealand's North Island. They are located 50–60 km north-west of Wellington, and immediately to the south-west of the larger town of Paraparaumu. The Maungakotukutuku area is located immediately behind Raumati. "Raumati" is the Māori language word for "summer". Raumati Beach is the northern of the two, both of which are popular seaside settlements on the coast of Cook Strait, within sight of the Tasman Sea. It has a population of 4,100. Following the laying out of Raumati Beach as a seaside resort in 1908, the first general store was built in Raumati Beach in 1919. The town has many landmarks including Kapiti College, in which Peter Jackson (New Zealand Filmmaker) and Christian Cullen (Rugby Union Footballer) received their education, St. Mark's Church, the vast sandy beach (popular for walks, fishing and people on holiday), The Raumati Beach Shopping Village, Kapiti Island and Weka Park. The main primary education provider is Raumati Beach Primary School. The Wharemauku Stream meets the sea in Raumati Beach on the northern side of Raumati Marine Gardens. This park is a popular recreation location: it features a ridable miniature railway and indoor, heated swimming pools that serve as the primary public pools for the surrounding area. The Beach offers a boat ramp and a tractor is on offer from the Raumati Fishing Club. During the year several large events are held at Raumati Beach including the Raumati Beach Surf Casting competition which attracts hundreds of fisherman from all around New Zealand. The Kapiti Woman's Triathlon is also held annually within the Marine Gardens and attracts large crowds and is well supported. 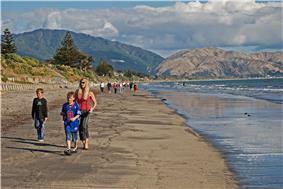 Two kilometres further south is Raumati South, which has a population of 3,200. In 1912, Herbert and William Eatwell had named the place Kawatiri, but the name was changed to the current one in 1934 because of another place with the same name in the Tasman Region. To the south of this town, between it and the town of Paekakariki, is the Queen Elizabeth Park, a 12 km² regional park used during the filming of The Lord of the Rings: The Return of the King, where it represented Pelennor Fields. Raumati South is known for its alternative lifestyle, and is very arty. The main primary education provider is Raumati South Primary School. There is also a Steiner school called 'Te Ra' located on Poplar Avenue. Tennis courts were built by Bert Eatwell in Raumati South (then Kawatiri) in about 1930. The first tennis club in Raumati South was established in the mid-1940s. A bowling club was established in Raumati South in 1945. A surf club was established in Raumati South in 1955. The Kapiti Bears - Kapiti Coast Rugby League Club Inc is on the border of Raumati South and Raumati Beach. The Club was founded in the 1970s and was the home of Kiwi and Melbourne Storm player, now Kiwi coach Stephen Kearney. The Club operates out of Matthews Park, Menin Road, and is affiliated to the Wellington Rugby League Zone. The local football club, Kapiti Coast United, plays at Weka Park in Raumati Beach. ^ "District History". District Council. Kāpiti Coast District Council. Retrieved 1 November 2010. ^ "Raumati Beach Village History". Raumati Beach Village. 2008. Retrieved 1 November 2010. ^ a b Perry, Maurice (2008). "Raumati South - Kawatiri - Some Early Memories" (pdf). Maurice Perry and Raumati South. Retrieved 1 November 2010.